Sony Pictures Animation’s acclaimed comedy “Cloudy with a Chance of Meatballs” began life in 1978 as a children’s book written by Judi Barrett and illustrated by Ron Barrett, which now has over a million copies in print. With its charming, visually inventive style, absurdist sense of humor, and fantastic premise – a town where food falls from the sky! – it seemed a foregone conclusion that the book would be adapted into an animated movie. But no one was quite able to do it until writer-directors Phil Lord and Christopher Miller came along and found inspiration from a seemingly obvious source – the book itself. “We thought, wow, that would be a great action movie,” says Lord. “All of the events in the film would be very, very silly, but the characters would take them all very, very seriously.” And you’d take it seriously, too, if a giant spaghetti tornado threatened your town, as it does to Chewandswallow. 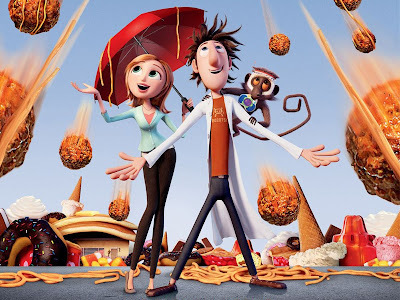 `Cloudy with a Chance of Meatballs’ represents the ultimate in food fun and mayhem. Still, it seemed natural to the filmmakers to tip their hats to the book by re-creating some of its most memorable images – a giant Jell-O mold, a giant pancake settling over a school, a sandwich sailing ship, and several other images made their way into the film as the writer-directors built a new story around them. Opening soon across the Philippines, “Cloudy with a Chance of Meatballs” is distributed by Columbia Pictures, local office of Sony Pictures Releasing International. Visit www.sonypictures.com.ph to see the latest trailers, get free downloads and play free movie games.